When listening to an album for the first time, there is a natural tendency to think “such-and-such sounds like these other artists,” as we try to pick apart the influences. 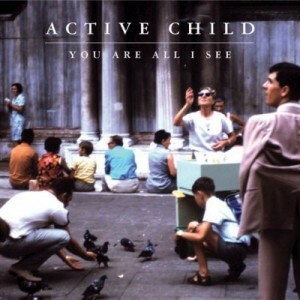 However, it is an equally accurate statement when listening to an album for the first time to say, “this is like nothing I have ever heard before.” This phenomenon is especially true when listening to Active Child’s You Are All I See, an odd, yet sweet musical combination of the familiar and unique. The standout title track opens lushly with synths, guitars, and apparently harps, layering on top of each other, with singer/leader Pat Grossi dreamily musing. What initially stood out was Grossi’s singing voice; strongly choral yet not overly dominant. Song after song unfolds languidly, creating full soundscapes that are quietly present. Similarly, Hanging On manages to evocative without be explicitly direct. The sounds were reminiscent of Vangelis, M83, Kenna, múm, Antony and the Johnstons, (maybe even some Fever Ray), though none of those comparisons are quite right. And although I am not quite sure that I like You Are All I See, I most certainly will listen to it again…probably because it just sounds so familiar. Not a patch on the EP.